If from abstract principles and paradigms of my previous article (Malthus, forever? ), we turn to the real, contemporary world, we may say that the rapidly expanding world population also has other consequences – beyond the reduction of “pristine” space – that may adversely affect the quality of the environment (space, in our paradigm) and bring about critical situations. Four of these consequences are strictly linked to sensitive environmental questions that will become critical as we proceed towards the end of the century, when world population growth, according to a rather optimistic consensus, is forecast to be close to zero. In the coming eight decades, the world is set to host an additional 3.4 billion people, a number equal to the increase accumulated in the preceding half a century. (iv) last but not least, global warming. Each one of these four processes may be described as a population-driven threat to the environment, affecting the quality of space available to humankind. 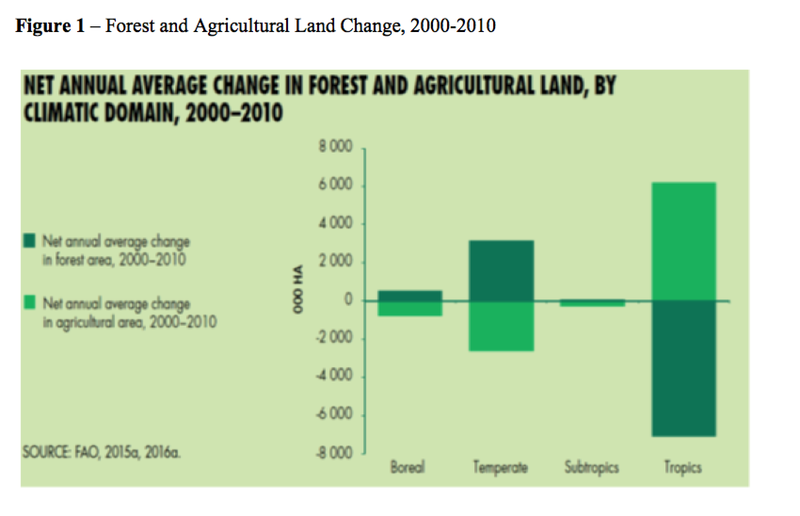 Deforestation processes have accompanied demographic growth ever since the initial spread of agriculture. The great forests play a crucial role in maintaining environmental balances by moderating greenhouse gas emissions, and thus global warming; by maintaining the integrity of water reserves; and by protecting biodiversity. Unfortunately, trees give more (immediate) profit when they are cut down than when they are alive and growing, and pasture and arable land have more (immediate) value than virgin forests. There is ample historical evidence of the deforestation process that occurred in step with population growth across Europe up to the Industrial Revolution. In North America, population settlement and industrialization wiped out the original woodland cover from Canada to the Gulf of Mexico. In coastal Brazil, the Mata (forest) Atlántica was greatly reduced by demand for wood for the sugar cane plantations and the mining industry, and in nineteenth century India, vast areas were deforested to meet the needs of railway construction and the corresponding demand for fuel, as well as for the shipyards and navy. Perhaps, the single phenomenon that currently arouses the greatest concern and debate is the deforestation of the Amazon basin, which is estimated to have eaten away between 15 and 20% of the rainforest cover. This process, which accelerated after the 1940s, is attributable to multiple factors: the acquisition of land for livestock and crops driven by the demands of a rising population at both local and global levels, timber production, mining and oil prospecting, infrastructure development and immigration. Similar processes have also taken place – or are taking place – in other parts of the world, such as the Congo Basin, Papua New Guinea and Indonesia. Figure 1 shows how, over the period 2000-2010, the development of land in the tropical regions for agricultural purposes has taken place at the expense of forested land. Fortunately, this process has been partially (but only partially) offset by the contrary trend in the te mperate regions, but the global balance has been negative for the planet’s health. Population growth has been particularly rapid in coastal belts, which are advantageous not only in terms of their climate and landscape but also with regard to communications and the multiple economic opportunities they offer. History teaches us that the majority of the world’s great cities develop along the coast or on major watercourses. However, coastal cities are also the most vulnerable. Uncontrolled expansion of residential and industrial infrastructure in such contexts has negative effects in terms of water contamination, degradation of areas of environmental value, as well as exposure to natural risks (just think of the more than 200,000 deaths caused by the 2004 tsunami). These risks are destined to grow as a consequence of global warming. The environmental vulnerability of coastal areas has become obvious in recent years given the recurrence of natural disasters (typhoons and tidal flooding) in the river delta regions of South and South-East Asia, especially in Bangladesh. Data on population distribution in coastal areas is scarce and unsatisfactory. First, there are no standardized (and therefore comparable) definitions of what ‘coastal areas’ actually are. Measures include estimating the population of a coastal belt of determinate width (10, 20… 100 kilometres from the sea), or, equally crudely, counting the population of administrative units that border the sea. A study making use of satellite measurements has estimated the population living within 100 kilometres of the sea but in areas at less than 10 metres above sea level in each country. These are the most vulnerable territories, and they are placed at further risk by rising sea levels and the intensification of extraordinary atmospheric events. In 2000, 10% of the world population lived in low-altitude coastal regions, which constituted 2% of planet’s total land area. 60% of these 634 million people lived in urban areas. In general, populations in coastal regions tend to increase more quickly than those living inland, and thus the degree of concentration along the coastlines tends to increase (Figure 2). The same study from which we draw these aggregate data also highlighted the dynamics in two countries – China and Bangladesh – between 1990 and 2000, which are home to about one-third of all inhabitants of low-lying coastal areas worldwide. In China the growth rate in these areas over that decade was 1.9%, versus 1% nationwide; in Bangladesh the growth rates were 2.1% and 1.1%, respectively. According to United Nations estimates, the world’s urban population has now surpassed that living in the countryside: in 2018, town and city dwellers represent 55% of the total, and this proportion is destined to increase in the coming decades. In many developed countries, more than 80% of the total population is classified as ‘urban’. A growing proportion of what is classified as the urban population today lives in big and sprawling conurbations with ill-defined boundaries. In 1950, there were 2 so-called ‘mega-cities’ or agglomerates of over 10 million inhabitants; by 1990, according to UN estimates, there were 10 of them, and 33 in 2018. Meanwhile large settlements of between 5 and 10 million inhabitants have more than doubled in number from 21 in 1990 to 48 in 2018, while the number of “small” settlements of 1 to 5 million people (i.e., “small” only in the terms of this international terminology) rose from 239 to 467. Demographic concentration in urban areas is not, as such, a negative phenomenon. Humans are essentially gregarious animals and tend to live in restricted spaces. But the modern mega-urbanization process has been compressed into a very short length of time, and has occurred in a disorderly and often anarchic manner. Its main negative consequences for the environment take the form of air pollution – with its well-known ill-effects for health – and water contamination, with effects spreading out into the ecosystem well beyond the mega-city’s own territory. Further consequences are the accumulation of waste, and the degradation of space. And since large conurbations are growing faster than the urban population – a gap that will likely intensify in the future – the negative effect on the ecosystem is destined to become further aggravated, unless robust corrective measures are taken. Diminishing pristine land and deterioration of space increase the cost of hosting each new human being. Other factors, such as increased greenhouse gas emissions, have a negative effect on the environment. Indeed, increased human presence on the planet is a powerful contributor to modern climate change, which entails global warming, rising sea levels, the tropicalization of the climate in temperate regions, desertification in some regions, and an increase in extreme climate events. This is a very intricate and technically complex subject, and here we will only touch on it fleetingly. It has now been proved that the increase in greenhouse gas emissions – due to the rise in population numbers and in human activities – is at the root of the global warming that has been underway over the last several decades. As we read in the IPCC’s (International Panel on Climate Change) Fifth Assessment Report: “Anthropogenic greenhouse gas emissions have increased since the pre-industrial era, driven largely by economic and population growth, and are now higher than ever”. 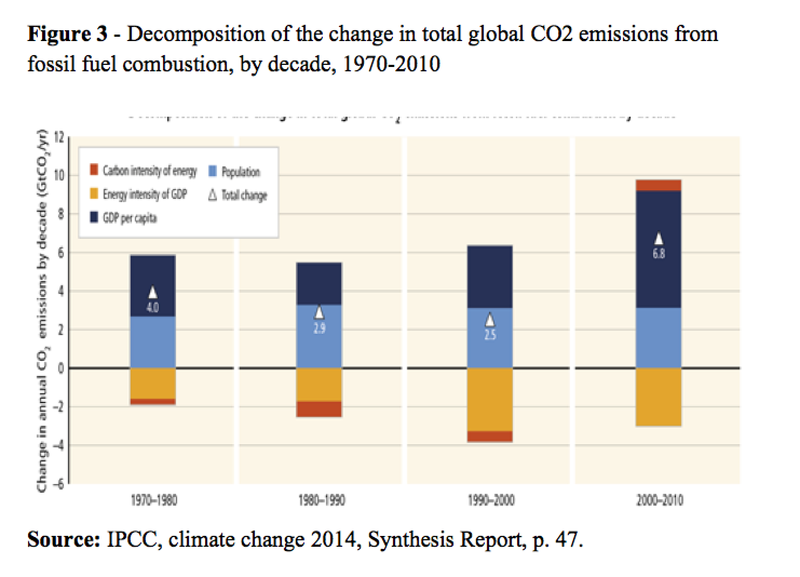 Between 1970 and 2010 there was an 80% increase in the volume of greenhouse gas emissions (four-fifths of which are CO2). All kinds of human activity have contributed to this increase, from energy production to industry, agriculture, housing, trade and transport. Rising population alone may be held responsible for close to half this increase (figure 3). The IPCC makes complex global simulations based on hypotheses regarding population increase, economic growth, and the rise in emissions. The most recent ones have confirmed that the tendency towards global warming (almost one degree higher in 2000-2010 than in 1850-1900) will continue across the next century. Depending on different hypotheses of emission increases, by the end of the century (2081-2100) the mean temperature on Earth will be between 1 and 4°C higher than it was in 1986-2005. Specialist publications explain the complex geophysical consequences of global warming, from the melting of the polar ice caps to rising sea levels, the desertification of vast regions and changes in ocean currents. All of these things are of great significance for human society. where global warming GW is caused by combination of Population, Affluence, Technology and (missing in Ehrlich’s original formulation) Behaviour B, which might be seen as a function of knowledge, customs, social norms and individual tastes. Virtuous behaviours can probably reduce global warming, everything else equal, although the extent of their impact, and how this impact can be measured remain unanswered questions. The notion that space is finite and that population cannot grow forever is probably obvious and intuitive for everyone. The difference with respect to a still recent past is that what once appeared as an immense, unmeasurable expanse of land at the disposal of humankind is now more clearly perceived as finite and increasingly limited. Population growth, dispersion of human settlements, development of technology, increasing wellbeing are the forces that reduce the available space in pristine conditions and endanger the quality of that space, either settled or under the impact of human activity. Space is, indeed, the ultimate resource and the final limit to growth. Malthus was right: nature “has been comparatively sparing in the room… necessary to rear …” us humans. This “room” is shrinking under our very eyes. According to the estimates, and to the median variant projection of the United Nations, the world population was 4.381 billion in 1979, will be 7.795 billion in 2020, and will reach 11.184 billion in 2100. More precisely, given the probabilistic approach followed in the projection, a population of 11.184 billion in 2100 represents the median value of a distribution that, within 80% confidence limits, ranges from a minimum of 10.089 to a maximum of 12.436 billion. United Nations, World Population Prospects. The 2017 Revision. On September 28, 2018, an earthquake followed by a tsunami in the Indonesian island of Sulawesi killed about 2,000 people. 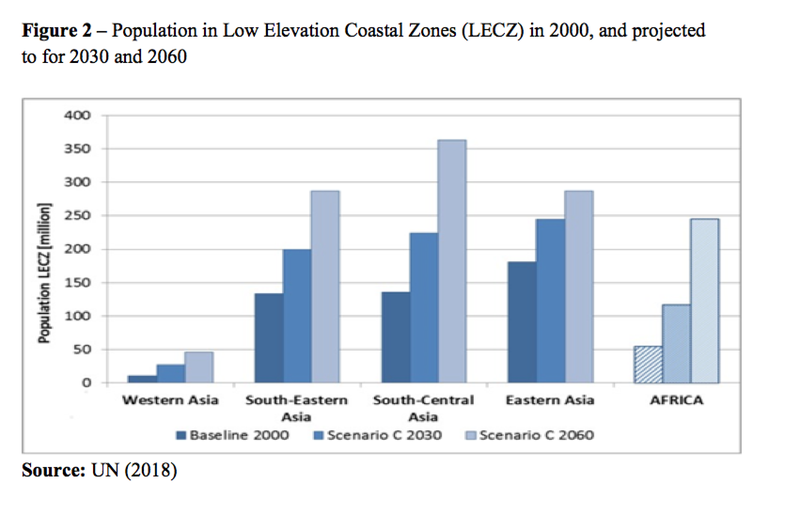 Gordon McGranahan, Deborah Balk and Bridget Anderson, ‘The Rising Tide: Assessing the Risks of Climate Change and Human Settlements in Low Elevation Coastal Zones’, in Environment & Urbanization, 19, 1, 2007, pp. 17-37. It is worth adding that the concentration of people in urban areas is very high in these same low-altitude coastal areas. International Panel on Climate Change (IPCC), Climate Change 2014, Synthesis Report, Summary for Policymakers.